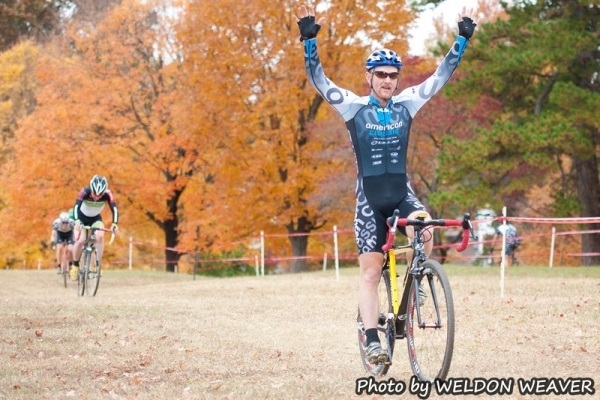 Charlotte hosted stop 5 of the NC state cyclocross series. A big crowd was on hand at Veteran’s Park, just outside center city. It was real cyclocross racing – the park had peak foliage, kid’s races, waffles, dogs, blankets and boots! Robert Marion (Robert Marion American Classic/Blue) got his second win in the series. Marion pushed the pace in lap two at the run-up hill and created a three man break. A loop in the tape near the pits caught his shifter and put him on the ground. He reconnected and used the hill to drop one of the trio. He spent the remainder of race trading off pace-setting with Alex Ryan (Champion System/Cannondale) – until the final lap. Marion’s two wins and three third place finishes, puts him in serious contention to win the series. Katherine Shields (Smartstop-MockOrangeBikes p/b Ridley) and her twin sister Emily Shields (Smartstop-MockOrangeBikes p/b Ridley) got first and second respectively – reversing their order from last week. Katherine held second wheel behind Allison Arensman (Fiets Maan CX–presented by: Studio7Multisport) for the early laps. Her disciplined approach for the run-up hill paid off. The series hits the midway point as it intersects with the national UCI series in Hendersonville next Saturday and Sunday.